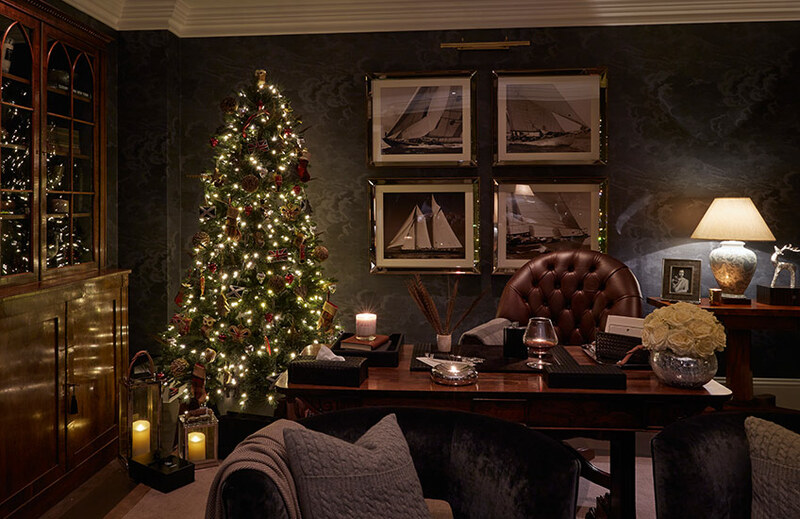 Christmas Decorating Ideas: What’s Your Festive Style? Christmas is coming which means it’s time to crack out the tree, polish the silverware and deck the halls. 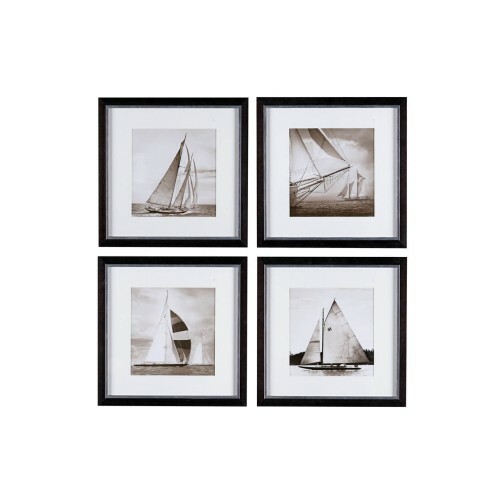 Are you a traditionalist or do you have a penchant for all-white decor? Are you dressing your stair bannister or make the tree your main focus? Whatever your plans this year, be inspired by these six Christmas decorating ideas to suit all tastes. 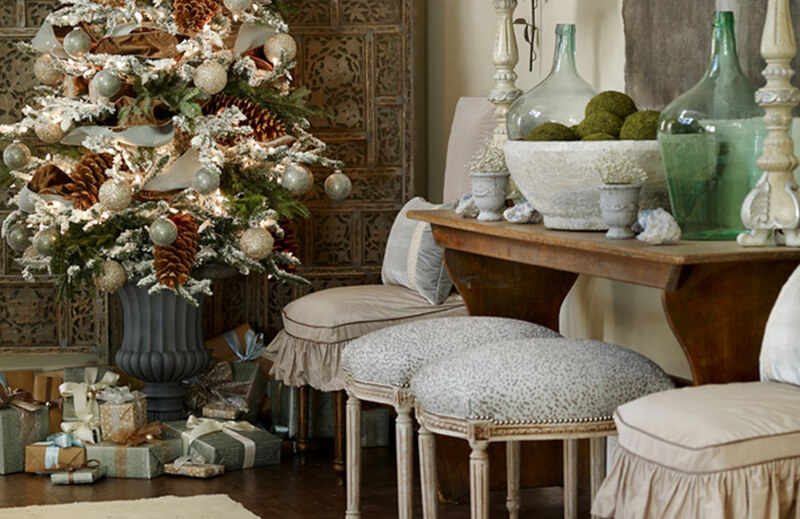 A classic white room – the kind that evokes thoughts of heaven as soon as you encounter its flawless ivory upholstery and divine plush carpeting – is a beautiful look at any time of the year, not in the least at Christmastime. Transforming an all white space into a frosty winter grotto will render it perfectly season-appropriate and one which will endure the years. 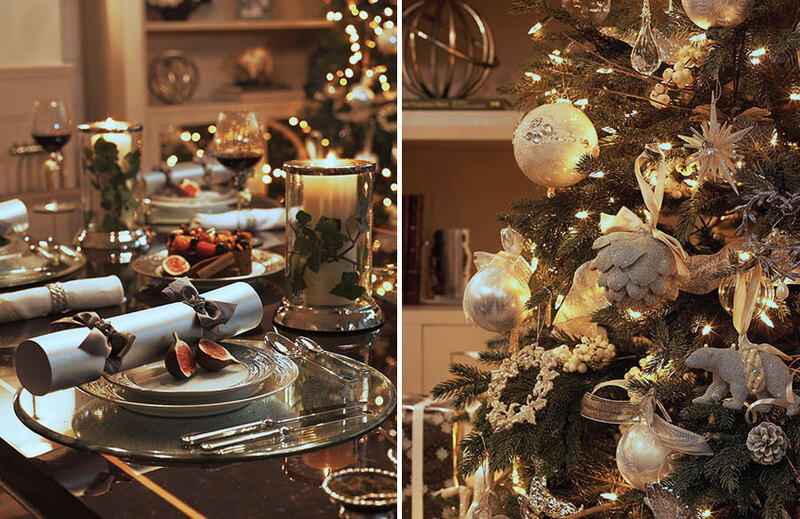 Pearly ceramic urns and hurricane vases become ideal places to showcase collections of baubles or frosted pine cones for a quick wintery update whilst timeless silverware (candlesticks are a must) and mirrored accents offer their inherent twinkle to the festive look. 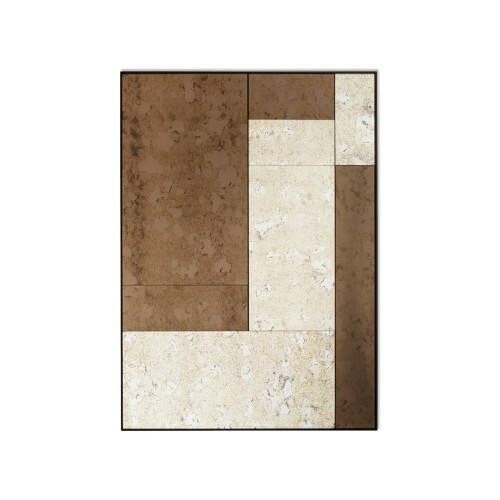 Selenite accents – a popular trend for 2015 – are by their very nature winter-approved and add an organic element to counteract glossier finishes. Another way to bring nature into this look without adding colour is to include frosty foliage, twig wreaths or pure white blooms. A timeless crystal vase – filled with eucalyptus leaves or dusty miller – alongside a sofa of neutral cushions creates an arrangement which will take you throughout the year. Sparkling crystal decorations hung on the tree joined with pure white fur stockings hung on the mantlepiece finish the look off to perfection. 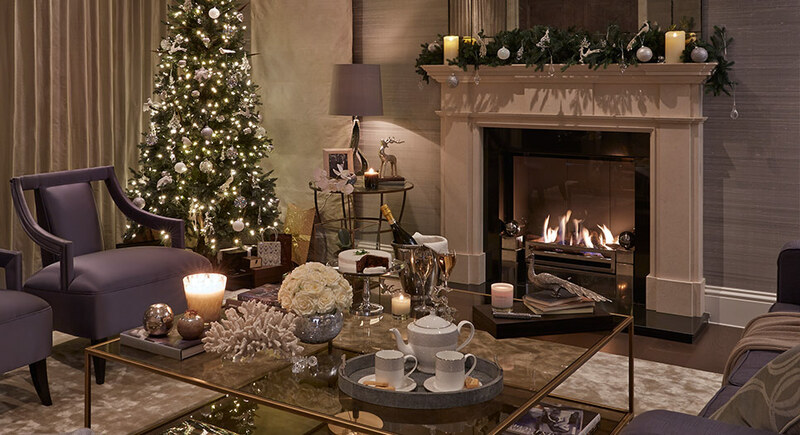 Heralding the return to a truly British Christmas, this scheme is a masterclass in cosy festivities and will leave you craving a full festive season of at-home activities. 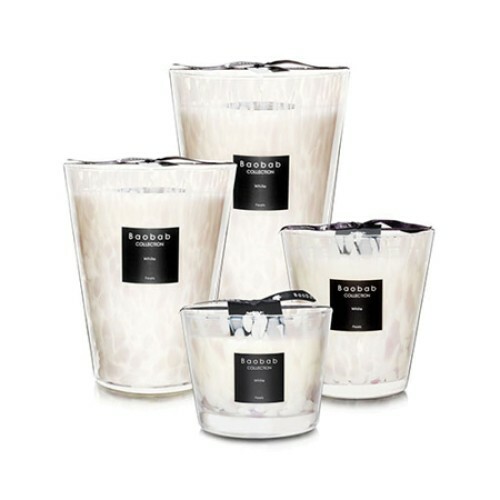 Imagine the smell of rich leather combined with woody seasonal scents; warm brown leather draped with exquisite cashmere. The style is a familiar one which never gets old. 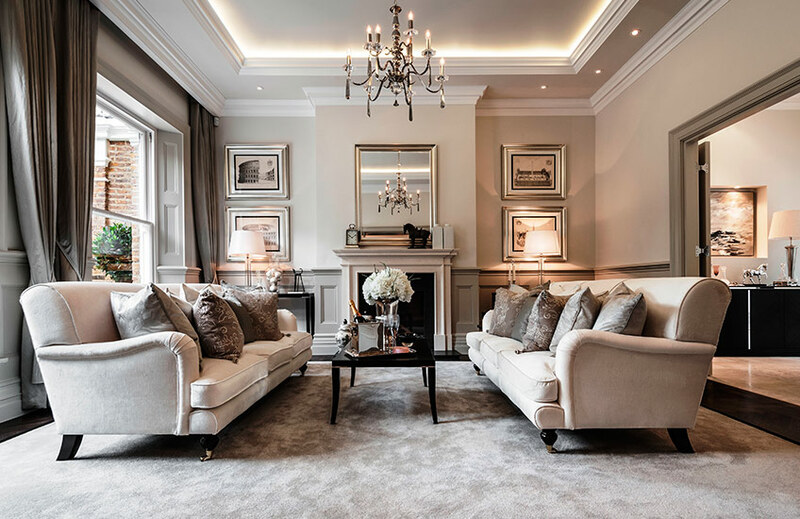 With a penchant for gentleman style, the look is the ideal choice for traditional masculine interiors, evidenced by its darkened palette and moody atmosphere. Bring the look to life with hurricane lanterns which add a sense of magic and offer just enough light come the long winter nights. Tartan cushions and throws create a multi-layered space which offers comfort on the coldest of days whilst braided leather desk accessories act as handsome touches to a home office. Taking style notes from this space, dress your tree with appropriately patriotic decorations. In this interpretation of the look, carefully beaded Scottish pipers, Union Jacks flags and red postboxes sit proudly side by side with woodland owls and antique baubles. 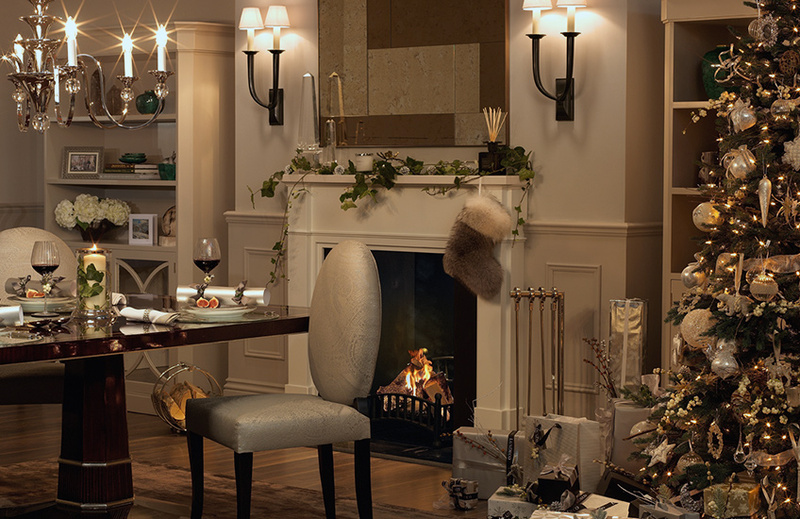 Channel a time-honoured Christmas style by opting for a refined country aesthetic. At home in charming rural environments or even classically-styles townhouses, the look makes use of natural and festive motifs and melds them with a muted palette of antique golds, moss green and earthy tones. 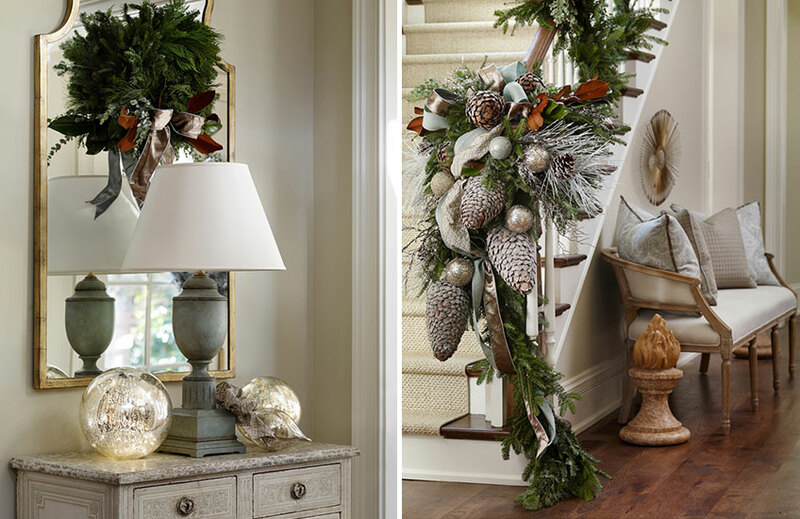 A pheasant feather wreath hung on a front door is enticing and sets the tone for the festive decor inside but a beautifully festooned stairway bannister or fireplace is this look’s calling card. Seamlessly blend nature with refined elements by placing luxurious satin ribbons and glittered baubles alongside pinecones and dried leaves. But it’s not just the wreaths and garlands of this look that feature these forest tones. Stunning malachite green vases or emerald shagreen accents will give your decor a similar evergreen richness which can be used year-round. 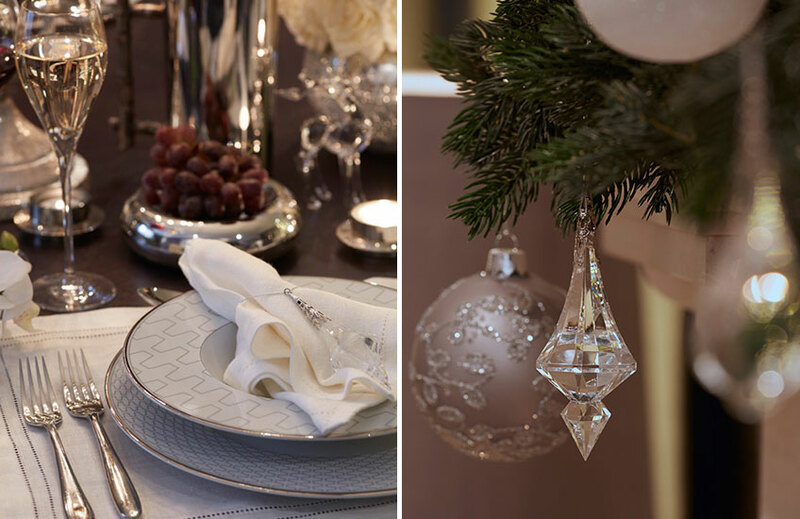 Tree decorations take style notes from a frosted woodland scene with feathered baubles and doves pairing up with glittered baubles in the most pleasing of ways. All that’s left to do is gather some wooden logs in a rattan basket, prepare yourself a warm drink and strike up the fire. A return to elegant entertaining is a hallmark of the Christmas season since, with the advent of December, is often found a social diary busier than any other time of the year. Ready yourself to embrace the celebrations with an appropriately styled space, paying particular attention to the dining room. 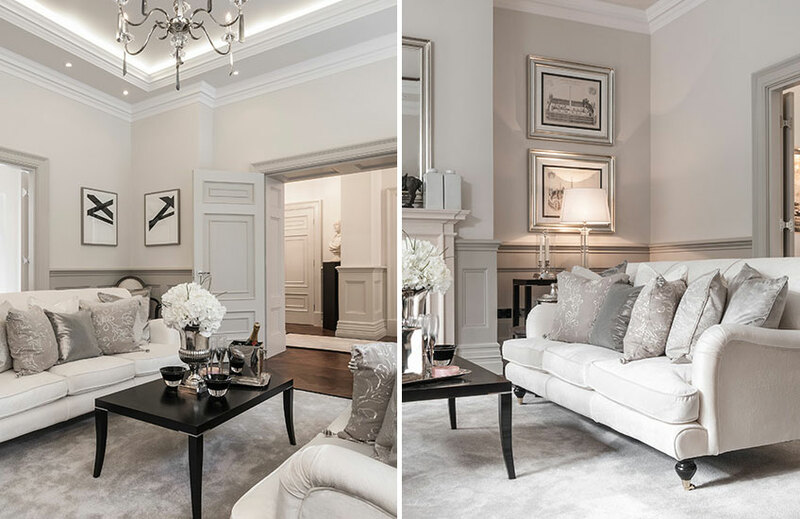 In this look, a calming neutral palette is enhanced with splashes of festive green; bronze additions counteract shiny silver finishes and classic architectural details are highlighted through the inspired lines of a timeless display cabinet, wall mouldings and complimentary artwork. 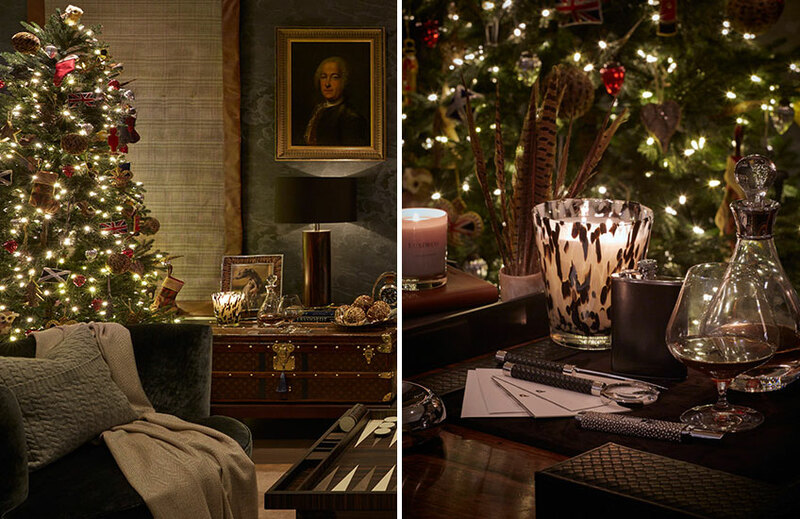 An antiqued mirror takes pride of place on a mantle dressed in trailing ivy and pine cones, crystal obelisks and aromatic seasonal scents. The dining table – featuring faceted column legs in a nod to Art Deco – is dressed with column candles, mirrored chargers and a textured dinner service for a visually balanced spread. Including oval-backed dining chairs, upholstered in a subtle silver paisley weave, adds classiness to the look. 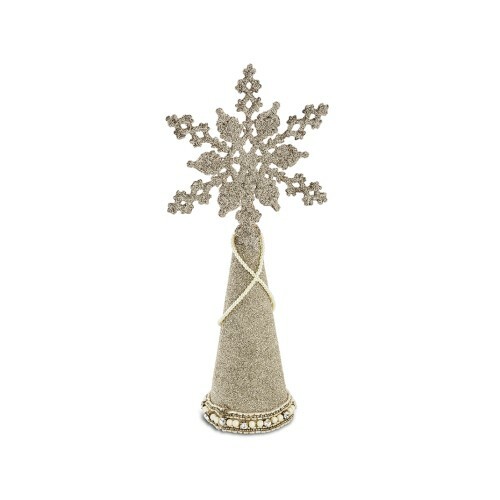 In the corner of the room, frosted drops suspend from the branches of an elegant tree wrapped in silver-flecked ribbon and dressed with a subtly glittered polar bears and reindeer. Christmas isn’t just for traditionalists as this monochromatic holiday home design would attest. 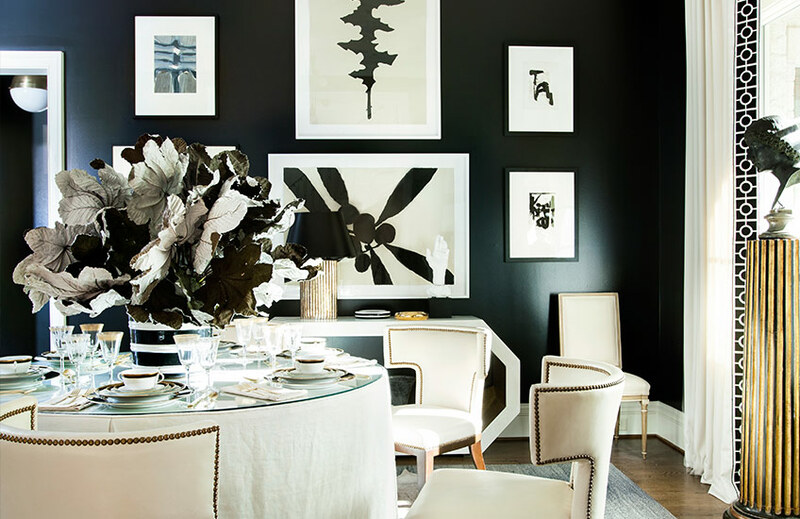 With modern artwork against a dramatic wall as its background, this dining setting combines a black and white palette with golden finishes for a perfect hybrid of classic and contemporary styles. It has as its foundation sophisticated silhouettes – a circular table is surrounded by modern klismos dining chairs, edged with nail-head trim – but this is offset with playful broad stripes. These adorn everything from the table cloth to the crockery and finally to the centrepiece vase (filled with oversized silk leaves). 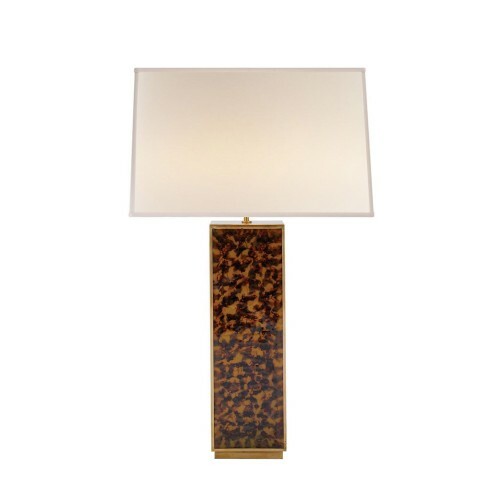 The look is unexpectedly glamorous as it harks back to the Art Deco era. Striped monochromatic plateware reimagines the much-loved Christmas table spread for a modern era and golden cutlery and gold-trimmed glassware add an opulence to the lighthearted style. 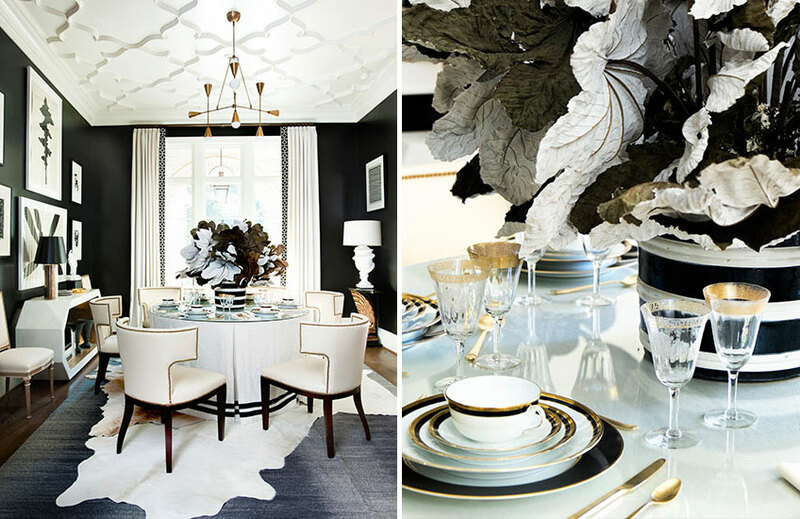 With the help of a graphic dinnerware set, statement centrepiece and opulent Art Deco touches, let the look inspire the non-conventionalist in you. You might find that, strangely, a monochromatic Christmas is your most colourful one to date. Christmas colours needn’t be confined to red and green – an existing colour can be easily adapted to suit your seasonal decor pieces. Create a winter wonderland with a twist by incorporating your room’s palette regardless of how unconventional. In this living room a palette of subtle purple acts as a pretty foundation for the addition of holiday decor including a contrasting green mantlepiece garland – appropriately decked out with leaping reindeers and delicate icicles. Cushions in the accent colour also work as the inspiration of your tree’s colouring. Winter roses in a crackle glass vase make for a charming centrepiece and even a coral sculpture (an unexpected feature in a wintery space) works well due to its gentle hue. 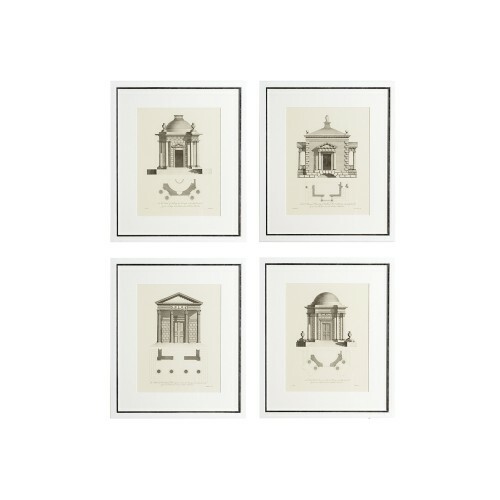 Both pieces are versatile all year round – evidence that your decor should fit around your home’s personal style. The presence of silver reindeer and peacock sculptures are easy-to-instal touches which will be enjoyed year after year, even as your room and Christmas decor evolves. In the dining room, accessorise your table display for the big day by replacing napkin rings with glamorous crystal decorations and introducing other elements from your living room decor for a cohesive look.